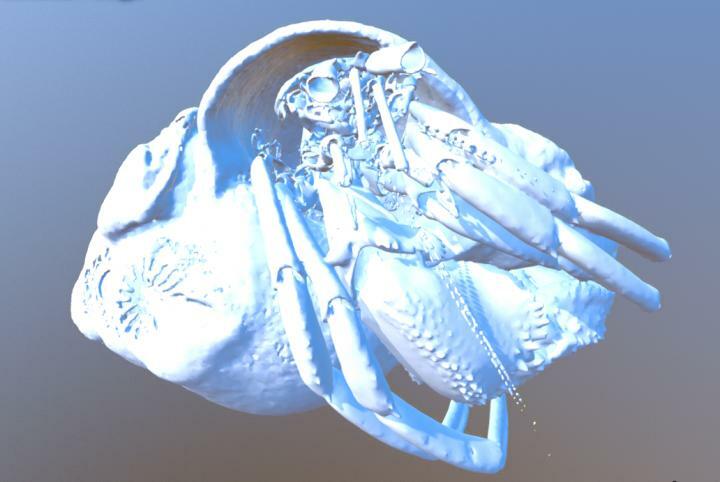 Today, a study published in the open access, open data journal GigaScience provides three-dimensional visual data from hermit crabs using the latest 3D microCT (Micro computed tomography) scanning technology. By making this microCT data publicly available, taxonomists potentially have more time and cost-efficient options for examining and comparing specimens for taxonomic research. With a shortage of trained taxonomists, this also provides new opportunities for education and training. To ease access to these data, the authors go beyond just describing the data collection and findings by providing downloadable, interactive files of everything in this study. For interested citizen scientists out there, they even include interactive web-based viewers and 3D printable file formats. The work here highlights new ways for researchers to share complex data without having to send out precious samples that can be damaged or lost. Hermit crabs (Paguroidea), are one of the most diverse superfamilies of sea crustaceans and are easily recognisable through the way their most-often asymmetrical pleon is concealed and protected usually inside a scavenged sea shell. With over 1,100 species and 120 genera recognised to date, there are many more as yet undiscovered or unidentified species sitting on museum shelves. Being of small size and having very similar body plans and membranous body parts that typically lack identification characteristics, hermit crabs can be extremely difficult to identify and thus remain taxonomically poorly understood. Proper identification requires careful examination, which depend heavily on the quality of the original species descriptions and illustrations. Much of these procedures have not kept pace with digital advances, and when literature-based descriptions have proven inadequate, the only option has been to contact museums to loan out valuable samples for physical examination. New three-dimensional microCT (X-ray micro-computed tomography) scanning technology provides a new tool in the taxonomic toolkit that can aid with species identification and be consulted by scientists before the physical material has to be sourced and shipped from natural history collections. Researchers at the University of Cape Town and Stellenbosch University, South Africa, use this approach to scan seven hermit crab samples. This includes three recently described species and one still undescribed species, as well as two scans of rare species, one of which is from a deep-sea habitat at over 500m depth. The most recent species description of Diogenes albimanus has just been published in the journal Zootaxa, where this data was used in the paper and review process. First author Jannes Landschoff contrasts this with the classical procedure of species description: "These specimens are too valuable to be shipped and can only be examined by one referee at a time. In this process, we used microCT in addition to classical drawings. The scan images provided less subjective data and were particularly suited to provide high-resolution surface images of complicated 3D structures that are difficult to draw. Publishing the dataset also makes the process of assessing whether a species is new to science easier to evaluate, not only in the peer-review process but also in later studies. At the same time these downloadable avatars can act as an insurance policy should the type specimens get damaged or lost." Although the physical specimens used in this study were deposited at the Iziko South African Museum (SAMC), Cape Town, South Africa, and at the National Museum of Natural History (USNH), Smithsonian Institution, Washington DC, USA, researchers interested in these samples can now inspect them in detail from the comfort of their home. The 3D scans are available for download and view from the GigaScience GigaDB repository. Widgets are available that allow embedding in your own website (see below for code). Using recently deployed functionality in GigaDB, surface-rendered CT images can now be interactively explored in the context of a web browser, enabling users to explore 3D images prior to download. As 3D printer (STL) files are also available for download, this demonstrates the potential for a new interactive species description. Senior Author Anton Du Plessis says of the advantages of X-ray microCT to visualize and analyse these new species: "This study clearly shows the power of the technique and the magnification allows precise identification of surface textures which are often missed in photographs or even in manual drawings." GigaScience's Chris Armit who deployed the new viewer in GigaDB said, "The 3D model viewer enables CT and MRI images to be interactively explored. This interface development has huge potential for Digital Biology, and enables morphology and in situ gene expression patterns to be explored easily using a desktop, laptop, or mobile device. We will be extending the visualisation tools to enable exploration of complex image data captured using optical imaging and molecular imaging techniques." Landschoff J, Rahayu DL. A new species of the hermit crab genus Diogenes (Crustacea: Decapoda: Diogenidae) from the coast of KwaZulu-Natal, South Africa. Zootaxa. 2018;4379:268-78. Find GigaScience online on twitter @GigaScience; Facebook https://www.facebook.com/GigaScience/, and keep up-to-date with our blog http://gigasciencejournal.com/blog/. GigaScience is co-published by BGI and Oxford University Press. Winner of the 2018 PROSE award for Innovation in Journal Publishing (Multidisciplinary), the journal covers research that uses or produces 'big data' from the full spectrum of the life sciences. It also serves as a forum for discussing the difficulties of and unique needs for handling large-scale data from all areas of the life sciences. The journal has a completely novel publication format — one that integrates manuscript publication with complete data hosting, and analyses tool incorporation. To encourage transparent reporting of scientific research as well as enable future access and analyses, it is a requirement of manuscript submission to GigaScience that all supporting data and source code be made available in the GigaScience database, GigaDB, as well as in publicly available repositories. GigaScience will provide users access to associated online tools and workflows, and has integrated a data analysis platform, maximizing the potential utility and re-use of data.